Summary: Suggestions for elements to be included in helmet rating systems, the best opportunity to improve bicycle helmets. I am pleased to present to this Workshop. I regard your work as the most significant opportunity for progress in improving bicycle helmets in the world today. The traditional standards organizations are not well suited to promoting improvements in helmet performance. They have so much inertia that they are slow to improve their standards, and are frustrated by inability to justify perfect new levels for testing. Without web presence to explain performance levels, they are stuck with calling out a single level of performance to be printed on the helmet sticker. That level becomes the designers' target. Lawyers and corporate representatives in the room agonize over the legal repercussions of every change and making current models obsolete. No manufacturer can promote a "safer" model for fear of lawsuits involving other models. There are few sources of test data for consumers. The one consumer magazine here in the US tests only a few models, leaves out the mass-merchant models that most people actually buy, and provides opaque and oversimplified testing reports. Folksam's innovative testing covers only helmets on the Swedish market. This group can do better. I have a few suggestions for you. 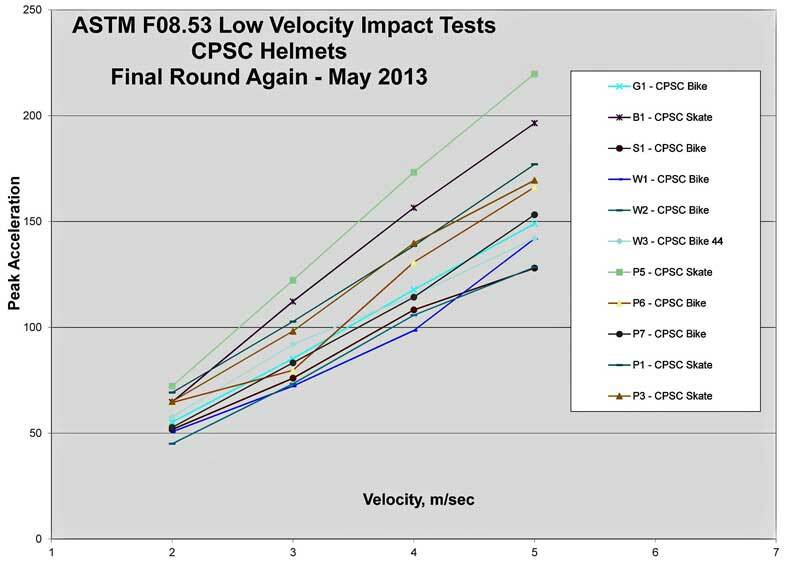 In the US, our ASTM F08.53 helmet subcommittee has been testing helmets in low velocity impacts. As this graph illustrates, there are significant differences in their ability to manage the energy of the impact, although they all met the high impact requirements. 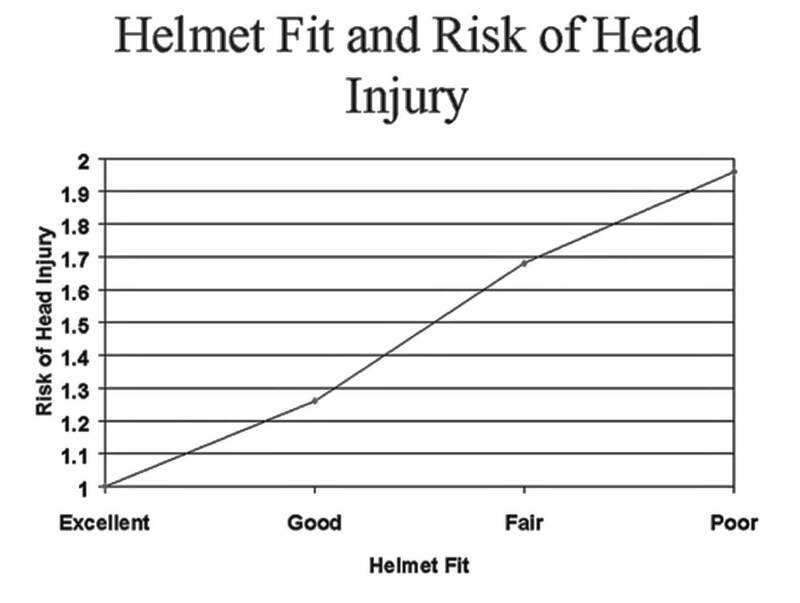 The data points represent the average peak g of four impacts on four helmets on the flat anvil at ambient temperature. The helmets mostly came from the marketplace. 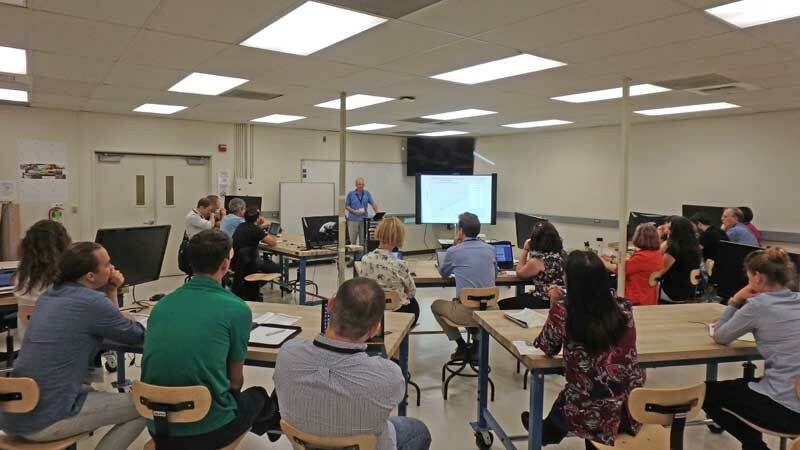 Based on that testing, a group of us tried to add a low velocity drop to ASTM bicycle helmet standards. With current research showing there is no threshold of concussion, we settled arbitrarily on 3.0 m/s (about .5m drop height). You will note from the graphic above that it would pass the majority of helmets tested but would flunk about a third of them. The best helmets came in at about 60g and the worst were about double that. We were voted down with many different rationales. I hope that members of this group will consider incorporating a test to verify the performance of bicycle helmets in lower level impacts in their rating schemes. No standard in the world now provides consumers with that rating. Given our current focus on concussion, all of us want to know how our helmet performs in a lower level impact. There are gradations of high level impact performance that are not being revealed by any current standard in the world. Legal constraints keep manufacturers from advertising that any model outperforms their others. The result is that designers are aiming for the performance required in the standards plus a slim margin to cover production variations. Our testing of cheap and expensive models showed amazingly uniform performance across the spectrum. Another high impact question is what helmet protection will best serve the various types of ebike users. Europe has begun work on a rotational performance standard. In the US we are just beginning to think about one. Relating it to actual injury in the field is difficult. Folksam is already reporting on their rotational test results. We continue to believe that rounder helmets are superior for crashing. Lab tests showed long ago that a helmet that adheres to the impact surface increases the user's neck strain and g's to the brain. There is no standard for that, although the exterior shape is most likely the first line of defense against excess rotational energy in a crash. Folksam's testing has shown that. Although fit is perhaps the most important variable for a helmet, no standard in the world has an adequate protocol for testing the ability of a helmet to be fitted correctly. Most have no test for the ability of the helmet to maintain that initial fit over time. And no standard rates the need for undue time and fiddling. This graphic from a Snell report emphasizes the importance of good fit. Most of the variation occurs because of impacts along the edges, or along the area where the edge of the helmet should have been. If the helmet does not fit well, there may be nothing between the consumer's head and the hard object at the time of impact. We consumer advocates are looking forward to seeing the results of your research and ratings.